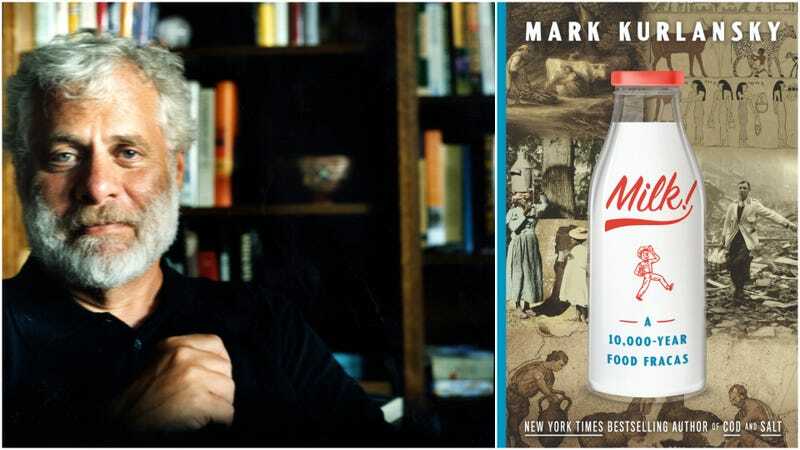 Author Mark Kurlansky built his reputation writing food history books (Salt, Cod) that illuminate history, culture, and commerce through the lens of just one food. His latest book is Milk! : A 10,000-Year Food Fracas, and it includes recipes, global case studies, and an explanation of how industrial dairy came to exist. Since releasing this book, Kurlansky has been interviewed extensively on the subject of milk, so how could The Takeout’s Q&A stand out? Taking a page from Meet The Parents, ours will focus on milk from animals other than cows. Caution: Yak yogurt ahead. The Takeout: How did cow milk become our dominant milk in the U.S.? Mark Kurlansky: It’s not only in the U.S., but in Europe also. And it’s simply because cows are the most productive animal. It’s often argued that it’s the best milk, but it’s really that the economics of it make sense. TO: What other types of milk are consumed around the world? MK: Milk is dominant in most of the world. There’s some goat and sheep, as there is in the U.S. also. There’s a little bit of camel, too, but camels are not a very profitable milking animal. There’s a small amount of donkey, which is mainly because there’s this belief in donkey milk being particularly healthy. Most of that is in Italy, and it’s done for cosmetics and health-related things. That’s about it. There’s still some mare milk in Mongolia, but again, they’re not particularly productive milkers. TO: How different tasting are these from cow’s milk? MK: It turns out cow milk is about the blandest milk there is. Sheep and goat and camel and even yak have very distinct flavors. They also have different fat contents—sheep and yak are fairly high in fat. Yak milk makes wonderful yogurt if you’re not on a diet. TO: In some of the nomadic and rural societies you write about, refrigeration isn’t available. Are there many people around the world still consuming unrefrigerated dairy? MK: No, not very much. It was always understand centuries before Pasteur that if milk sat around very long, it would make you sick. And so for a long time, people just didn’t drink milk unless they lived on a farm. So it’s really refrigeration that has promoted the drinking of milk. Even when feeding babies milk in the earlier centuries, people would often try to just attach the baby to the animal. Orphanages often had some goats available and would just bring the baby to the animal; that was the safest way to do it. I have to say, I never did that. But I was staying at a friend’s goat farm and I’d go out in the morning with my espresso, and I’d milk it right into there. And it comes out steaming, so you put a couple squirts into the espresso and you have this great goat milk cappuccino. TO: What’s the strangest milk or milk product you tried in your research for this book? MK: As I said, I really liked yak yogurt. In Dubai, I had some wonderful ice cream made with camel milk, I believe it was saffron ice cream and cardamom ice cream. Really great. Not so much milk but certainly some milk products [were difficult]; rancid butter in particular. I really don’t like rancid butter. You go to these Tibetan temples and it just knocks you out, the smell of rancid butter. They use the butter for lamps and also carve statues out of it, and they keep them for years. Their tea with rancid yak butter is one of the most awful things I’ve ever tasted. TO: Can humans theoretically drink the milk of any mammal? MK: You can, but the health benefits vary widely. Marine mammals have extremely fat milk, up to 30 percent. Baby whales and baby seals, these animals need to put on a lot of fat very quickly, which we humans probably wouldn’t want to do so we don’t drink those milks. Milking a whale would not be easy.